Sugar skull cut on reclaimed lumber, pre-paint. At Handibot and ShopBot, we love to hear from our customers and see some of the awesome projects that are being done on our tools. The network of faithful users who host us onsite and post on social media have blown us away with ideas that shape the way we look at making our tools. But with all of the cool stuff being made out there in the world, it’s easy to overlook some of the stuff that’s happening right under our noses. ShopBot’s very own Richard Hill has been experimenting with all sorts of interesting designs and projects with reclaimed wood and his Handibot, ranging from intricately-carved patterns to boxes and statement pieces. 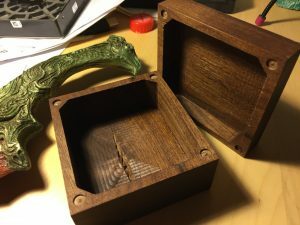 This box was made from reclaimed wood. Note the crack in the bottom that makes it a truly unique piece. A North Carolina native, Richard spent several years in Oregon before coming back to work at ShopBot. During his time in the Pacific Northwest, he found himself at the crossroads of both an environmentally responsible scene and technological growth culture, which shaped the idea that while trees are a plentiful resource, it’s easier to find things that have already been made from wood that are no longer in use. While these discarded pieces or slightly imperfect hunks of wood may no longer serve their original function, they are still perfectly good specimens of wood that can be made into something interesting. 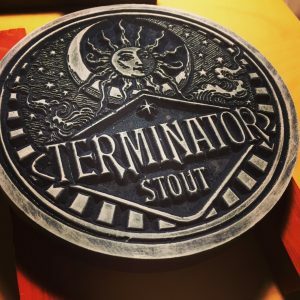 Sometimes, the Pacific Northwest influence creeps in, like with this Terminator Stout logo. For Richard, working with reclaimed wood requires special attention; you might not always have a perfect edge, or even the ideal piece you need for a project. 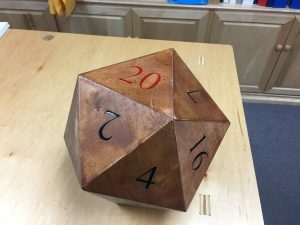 One such endeavor involved creating a large 20-sided die, like those found in tabletop games (of which Richard is also a fan). While many would see this as a simple project that just involved cutting down a block to have 20 faces, Richard really wanted to deconstruct the geometry of it and assemble it piece by piece, creating an actual dodecahedron (the fancy math term for the shape). This also allowed the use of less wood, and made the reclaimed wood materials easier to come by, since it just needed to come in sheets as opposed to a large chunk. Doing the project in this way involved precise calculations of angles and design considerations to ensure everything would fit together, all without being able to assemble it until it was all cut. The result was a series of 20 beveled triangles, which laid out formed a sort of amorphous geometric shape. 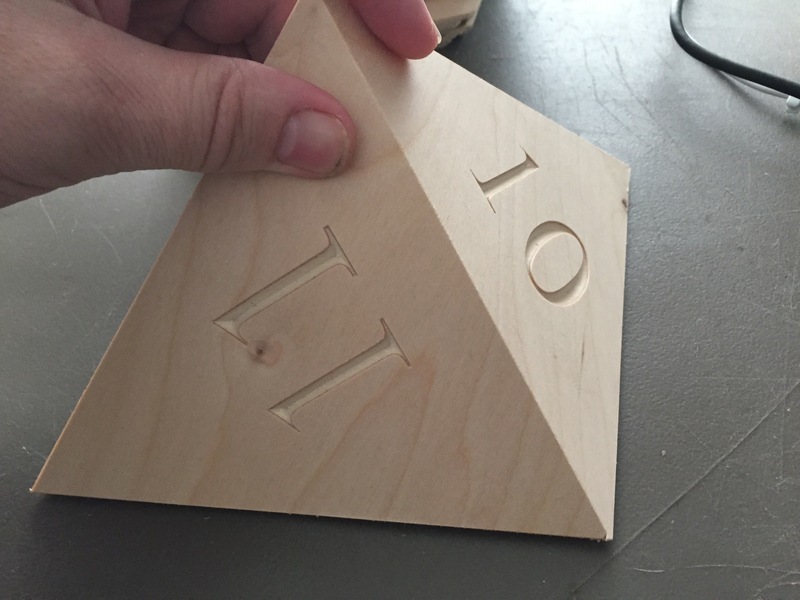 Each triangle was numbered to not only make it look like a giant 20-sided die, but also to help with the assembly process. 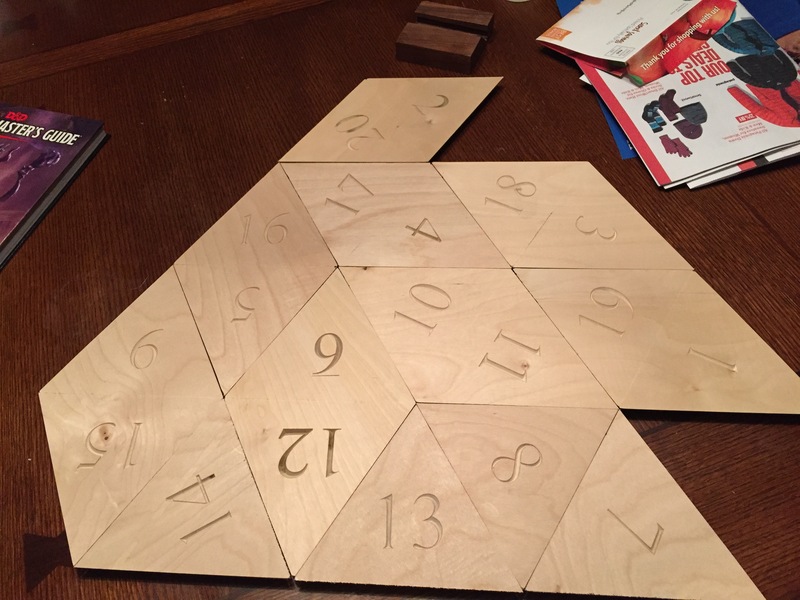 Pieces cut for dodecahedron, before assembly. 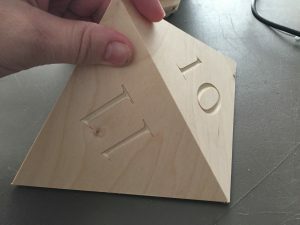 The triangles were cut at a precise angle to allow for proper assembly. 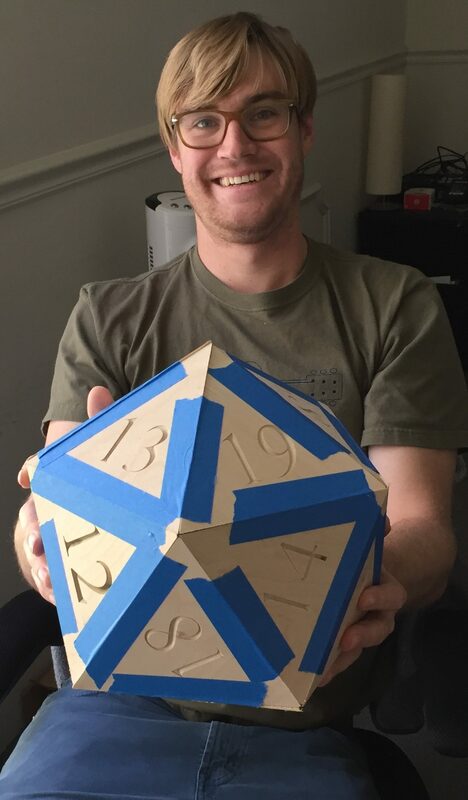 ShopBot’s Brendan Collins models the taped dodecahedron. Once cut, numbered and laid out, the pieces were all aligned and assembled, then needed to be taped together to allow the adhesive to dry, since there was no supporting center to the object. With the adhesive dry, the piece could then be stained and painted, giving it an awesome, shiny, and antique look. The finished die, stained and painted — crit hit and all! These are just some of Richard’s excellent projects. For more, be sure to follow the Instagram accounts for his Sprocket Designs and Handibot. 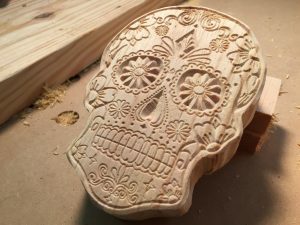 For more on cutting and designing with Handibot, visit handibot.com!